Mitsubishi Motors says it has secured extra funding from investors, boosting a vital rescue package for Japan's only unprofitable vehicle maker. The troubled company has been hurt by vehicle recalls and revelations that its management covered up safety flaws. The company's future has been uncertain since key shareholder DaimlerChrysler withdrew financial support in May. Backers have now pledged as much as 546 billion yen (£2.7bn; $5bn), up from an initial offer of 450bn made last month. As part of the new agreement, US bank JP Morgan will provide 150bn yen of financing. It had previously promised 100bn. Tokyo-based investment fund Phoenix Capital will inject up to 100bn yen, with further money coming from Mitsubishi group companies and China Motor Corp. Earlier this month, Mitsubishi announced fresh cost cutting measures after warning that its earnings were slumping more quickly than forecast. Among the new measures were cuts to pension rights, salaries and bonuses. 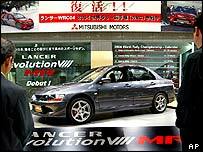 As part of the first rescue package, Mitsubishi agreed to the loss of some 11,000 jobs, or 22% of its global workforce. It also would close manufacturing plants in Japan and Australia, while US factories would be reorganised. Since then, however, the company has had to recall even more vehicles, increasing the need for money, analysts said.